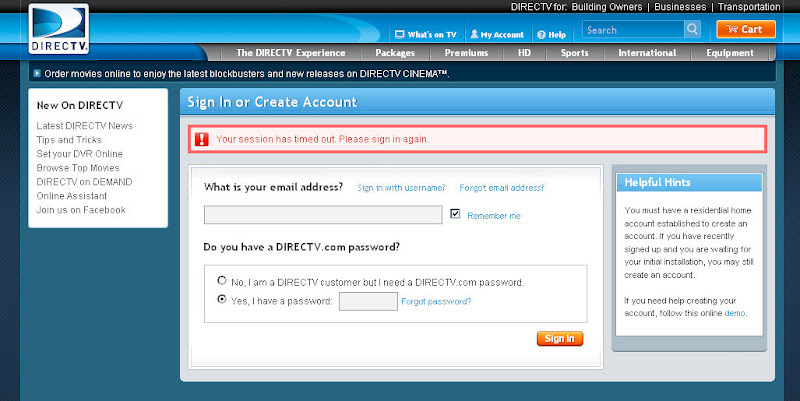 My session on DirecTV.com timed out and I was redirected to the page shown above. While I find no problem with being timed out due to inactivity, there are a number of strange things on the timeout page. If I was timed out, why I given an option to say I don't have a password? And why is there a link to instructions for created an account? Likely reusing a generic sign in page. Then, the Helpful Hints on the right state that I need an account to create an account. Using the same word, account, to describe two different things in the same sentence isn't a great example of clarity.